If you want a bit of hygge in your next holiday, look no further than Copenhagen in Denmark. For those of you who don't know, hygge is pronounced hue-guh and is the Danish word for feelings of cosiness, wellness and contentment. And that's exactly what we were looking for. Copenhagen is one of those far away cities I have always dreamed of visiting, and when Jason and I were mapping out destinations for our honeymoon, Copenhagen was at the very top of our list. We spent three nights in Copenhagen but we could have easily stayed for a week, or two, or three - there is just so much to see, and do, and learn. It's one of the most creative, progressive cities I've visited, and as a little side note, it also has a very special place in our hearts as Jason's father's side of the family is from Denmark. The fact that Dusty has Danish heritage warms my heart! Read on to find out what you can get up to in 48 hours in Copenhagen. And I dare you not to book your flights there when you have finished reading this blog post! Fruit and flowers for days at Torvehallerne. Copenhagen is accessible by plane. You can also catch the train over from Sweden. Getting to and from the airport is super easy, you can catch the Train or the Metro depending on your final destination. You simply buy your train ticket when you arrive at the airport and for those of you who don't speak Danish, that's ok! Almost everyone speaks English and there are a lot of people on hand to help you at the airport. We love using Airbnb when we travel, especially with a toddler in tow. It means we have a bigger space to relax and recharge after big days of exploring, and Dusty also has his own room. If we were to stay in a one bedroom hotel room with Dusty, it's not ideal for us as he is in bed by 7pm and that means lights out for everyone. The alternative is to book a room with two bedrooms but that can get expensive. We find Airbnb way more affordable and we always choose an apartment or house with a kitchen so we can cook our own meals. It's such a great way to save money on the road! For this trip, we chose to stay in this kid friendly apartment in the hip suburb of Vesterbro. It was super close to Copenhagen Central Station and to the Meatpacking District, and within walking distance to all the major sights, cafes and restaurants. There are plenty of houses and apartments to choose from on Airbnb, but if you are looking to stay in a beautiful hotel and want to splash out, you can't go past Hotel SP34, Hotel Sanders and Nobis. Walk and cycle everywhere. Copenhagen is one of the most walkable cities in the world. And boy, did we walk. Taxis are expensive, so we would usually get one on our way home if we were tired. Copenhagen is not the most pram friendly city, so make sure you have a strong pram. We took our friend's Vovo with us, and it wasn't great. I would have much preferred to have brought our own pram, which is by Reds Baby and can handle all the cobblestones. But it is a lot heavier than the Vovo, so all in all, the Vovo served us well. Nyhavn is in the heart of Copenhagen. I recommend going first thing in the morning to avoid the tourist crowds - it can get very busy and hot in the summer months. And there's a reason why, the ice cream coloured buildings are beautiful! Also don't get sucked into the restaurants in this area as they are way overpriced. 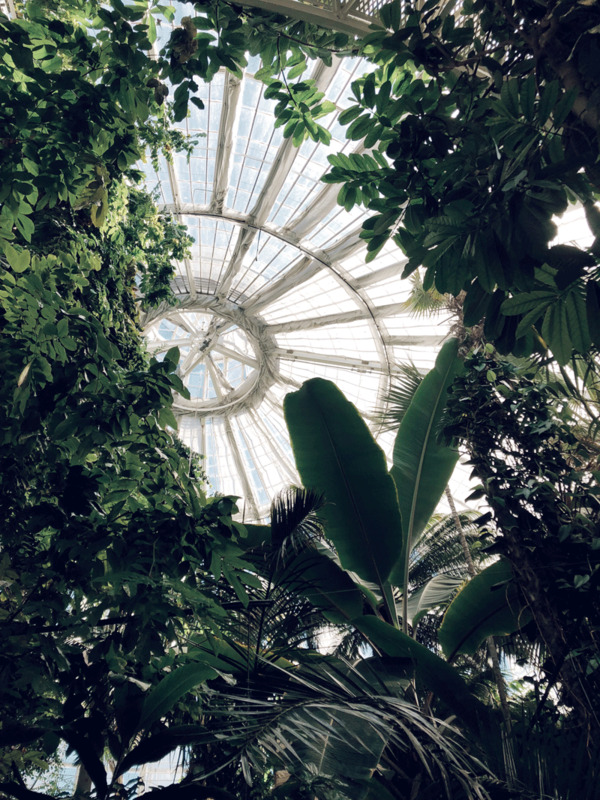 You can't miss a visit to the exquisite The University of Copenhagen Botanical Garden. Located in central Copenhagen, the garden covers an area of 10 hectares and has a spectacular historical glasshouse dating from 1874. The Palm House was our favourite, as were the narrow, cast-iron spiral stairs leading to a viewing platform at the top. Beware, it gets very, very, very hot up there! Not ideal for babies. If there is one thing the Danish do well, it's design. If you can only do one thing in Copenhagen let it be the Danish Museum of Art & Design. The chair exhibit is heaven on earth! Stop into Hay Design to drool over the perfectly Scandinavian designs and treat yourself to something small that you can take home with you. Rosenberg Castle and the surrounding flower gardens is the perfect spot to enjoy a picnic. The Tivoli is the original fun park, in the world. Disneyland was modelled off The Tivoli and whilst we were in Copenhagen, The Tivoli was celebrating it's 125th birthday! Fun fact, The Tivoli opened up on my birthday on the 15th of August! When you hear of Copenhagen, lots of people will tell you about free town Christiania. You are either going to love it, or hate it. We didn't like it at all. It has a very seedy vibe, not really our scene. But we had go and give it a try! Even if Dusty got caught in numerous plumes of weed smoke… We also caught a taxi there and back into central Copenhagen. The shopping in Copenhagen is very, very good. Stick to central Copenhagen around Hay Design. Be aware it gets super busy on the weekends and isn't the enjoyable! Torvehallerne was the heart of our food experience in Copenhagen. It's a huge food market located in central Copenhagen with over 60 stalls and serves up fresh, gourmet food all day long. Here we had the best cinnamon buns of our lives, plus loads of other delicious food. You cannot come to Copenhagen without stopping into Torvehallerne and t's super popular in the summer months. Prepare for the crowds during the middle of the day, but the atmosphere is so worth it. The coffee at The Coffee Collective is really good too! If you are serious about food, you have to get to Noma. You will need to book in advance, like a couple of months, and they only release new bookings in waves, so jump online and try your best! Sadly we couldn't get a booking on this trip. If you love Mexican, you have to stop by Hija de Sanchez at Torvehallerne. Hija is Mexican and is from the US. She actually used to work at Noma, so you can imagine how good her food is. The tacos and margaritas are to die for! 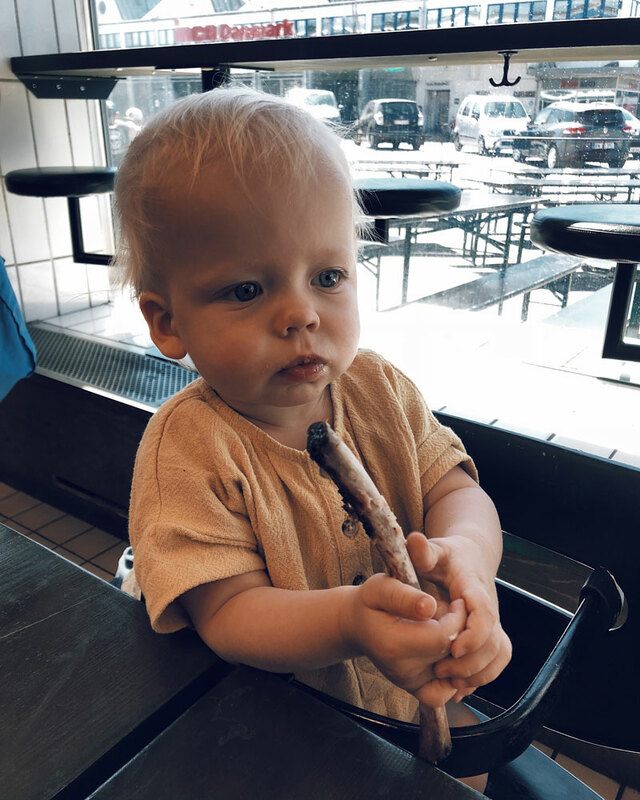 We loved having breakfast at Mad & Kaffe. It doesn't open till 8am, which is a little late for us as Dusty is awake by 5am most mornings (thankfully we are morning people!) but it was worth the wait each day. They also do the best iced lattes with oat milk - YUM. Smörrebröd is serious business in Denmark, so you have to stop into Aamanns for lunch. We found smorrebrod is best served shared, so order a few different ones and share them with your travel buddy. If you want to experience a proper Danish pastry, you have to stop into Skt. Peders Bageri. It also happens to be the oldest bakery in Denmark. We love watching Action Bronson's tv show "Fck that's delicious" and this is where we found out about Warpigs. Owned by an American who moved to Copenhagen a few years ago, Warpigs is a big brewpub in Copenhagen's buzzing Meatpacking District (and located literally two streets away from where we were staying). Serving up true American BBQ, this is not the place to go is you want a light meal. You have been warned! You will be rolling out afterwards and finding the nearest park bench for a sleep. We loved our Airbnb apartment! Lots of cute details, and hygge of course! The tacos at Hija de Sanchez is life! 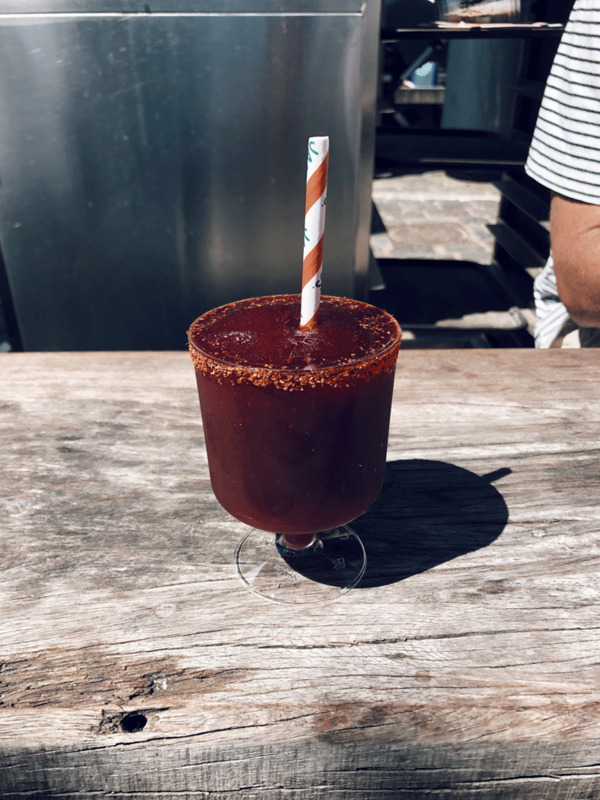 This slushy margarita from Hija de Sanchez is all you need on a warm summers day. Stumbling into another good coffee shop. Skt Peders Bageri, the oldest bakery in Denmark. We loved Hay Design! Tempted to buy so many things. We loved Mad & Kaffe! You order from the Mad & Kaffe menu by selecting your items. So hip it hurts! Cause a ruckus whilst waiting for our meals. Oops. Enjoyed an iced latte - oat milk was a revelation! Breakfast at Mad & Kaffe is exceptional! Dusty says the pencils were delicious too. Back at Torvehallerne for the cinnabuns. The beautifully coloured apartment buildings in the street of our Airnb. Cinnamon buns. My daily guilty pleasure. And my absolute weakness. I fell madly in love with the Botanical Gardens. Don’t be fooled, it was so hot and muggy from this view. The Botanical Garden and my boys, always waiting whilst I take photos. The sign actually reads “don’t sit on the grass”. The smørrebrød at Aamanns was out of this world and perfect for sharing. Rosenborg Castle is super pretty. Hej Mary! The Tivoli was so cute and fun!